This gorgeous, tree like, Rhododendron has flowered early in 2016. Three months early! 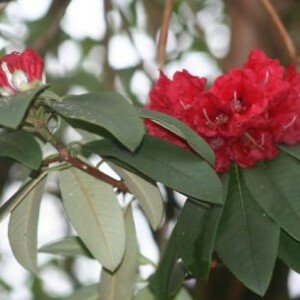 In the past we have won awards with this species at the RHS main Rhododendron show in April! The whole garden is erupting with spring colour and its still only the first week in january. The compact trusses are deep crimson to scarlet in colour. Originally from Western Yunnan to NE upper Burma and introduced in about 1884. They make a statement specimen tree in the garden.